All things considered...non-traditional students are changing everything. Close followers of this blog already know that we’re watching the non-traditional trend. We’ve blogged about it before, published an entire free e-book on the topic, and even have an extended version of that e-book available to Intead Plus members offering them concrete marketing tactics and student personas. So, needless to say, it’s a topic that’s on our minds a lot, and on the minds of many of our colleagues in higher ed. Praise for Intead's "Quality. Cost. Convenience. How academic leaders are competing for today's non-traditional students"
Why? According to research by the Center for Postsecondary and Economic Success (CPE-S), an institute of the Center for Law and Social Policy (CLASP), enrollment of non-traditional students is projected to grow 21.7% from 2016 to 2022. That’s compared to just 8.7% projected growth in the traditional student sector. With numbers like that, it’s easy to understand why those of us working in student marketing and enrollment are eager to explore the needs of non-traditional prospects. But the topic is complex and ever-changing, in part because the group we are lumping into this ‘non-traditional’ label is so vast and varied. The challenge: how to reach such a segmented audience? Who are they? Where are they? What do they read? More praise for Intead's "Quality. Cost. Convenience. How academic leaders are competing for today's non-traditional students"
Wait wait.... who are we talking about? These audiences have very different needs and desires—so when we say we’re intrigued by the ‘non-traditional’ trend, we really mean we’re interested in the growth of dozens of market segments that fall under the term’s broad umbrella. It’s a lot to keep on your radar, and following a topic so large can feel daunting. We like to think that the resources we produce here at Intead can be more than a little helpful to enrollment professionals looking to expand their institution’s non-traditional reach-- but we also strongly encourage you to check out NPR’s invaluable “Changing Face of College” series. This past May, the network began updating this helpful one-stop-shop for non-traditional learning stories. They’re covering the financial beat (student loans, debt, government grants), personal student stories, changing enrollment demographics, and more. Most recently, we were grateful to the series for giving us a heads-up on a new book by Rebecca Klein-Collins, geared towards non-traditional students themselves. In Never Too Late, she offers guidance to adult learners who are thinking about enrolling in a higher ed program for the first time, or returning to school after a time away. She tackles all the essential topics: how to pick an area of study, how to finance a degree, how to find institutions that offer flexible scheduling, and—most interestingly to us, and perhaps to you—how students can evaluate potential programs for their level of expertise in accommodating the needs of non-traditional learners. There’s even a ranked list of the best schools for adult learners. Do we have your enrollment marketing interest now? Think about how many books there are out there for high school students trying to select a university...and now think how few there are for the enormous adult learner market. Now think about how useful this book could be not just to potential students, but to professionals trying to enroll those students! Conduct an audit about what your institution is doing right—and how you might be scaring away your prospects? Our ebook offers recommendations about how to think this through. 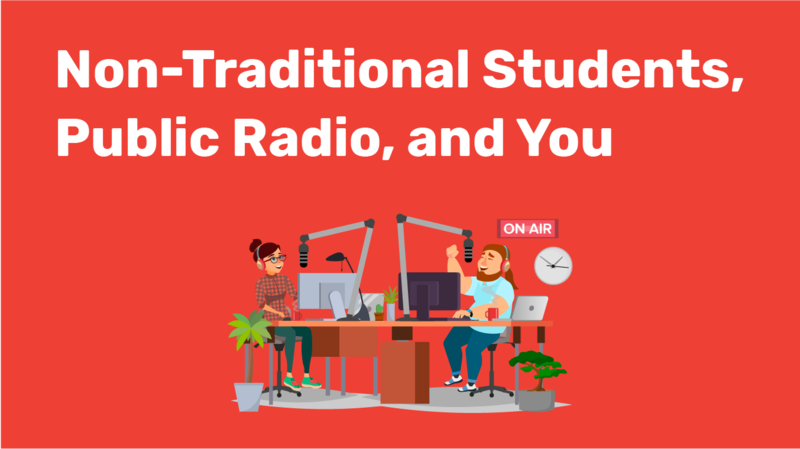 If you’re not thinking about the non-traditional student market, you need to be. Regardless of whether non-traditional students make up a significant chunk of your student body today, this demographic will be dominating higher ed in the years to come. Those institutions best prepared for that change will flourish, and those that don’t may face new struggles. So here’s some easy first steps. Get reading. Be it NPR, our resources, Inside Higher Ed, Chronicle of Higher Ed (check out Goldie Blumenstyk's research), or any of the other platforms covering this topic, make reading about non-traditional student issues a scheduled part of your week. Set aside a few minutes at a regularly-appointed time to stay up-to-date up on the topic. Consider your non-traditional personas. What kind of non-traditional student would your institution be most likely to recruit and retain? What kind of student would truly succeed there? Why? Marketing personas are a way of conceptualizing your target market—and a key first step to getting serious about your efforts. You’ll find more info in our e-book. Needless to say, we’re always happy to connect with you about where your institutional efforts are at, where you want to go, and the steps you need to take to get there (or, hey, just enthuse about Planet Money with you). Drop us a line at info@intead.com.